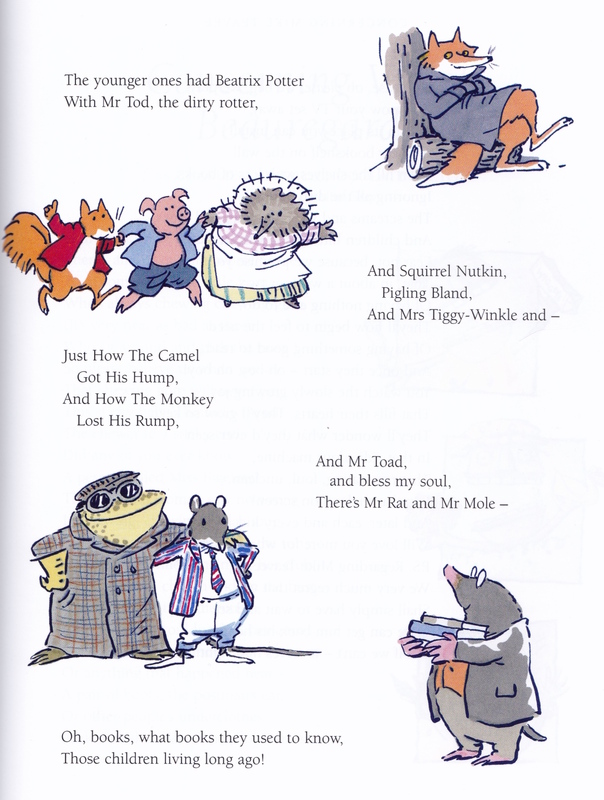 One of my biggest bugbears when reading a children’s book is running into a lengthy song or poem. 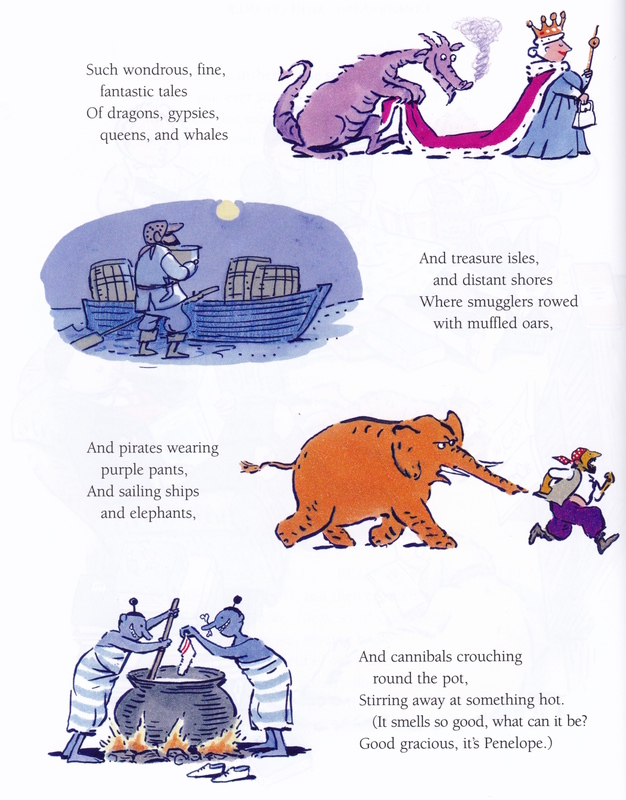 No matter how artful the rhyme scheme, or witty the allusion they never fail to pull me out of the story. Even when read aloud, verse passages only serve to annoy. My impatient children often demand I skip these sections entirely. I have on occasion tried singing the words, but that only made things worse. 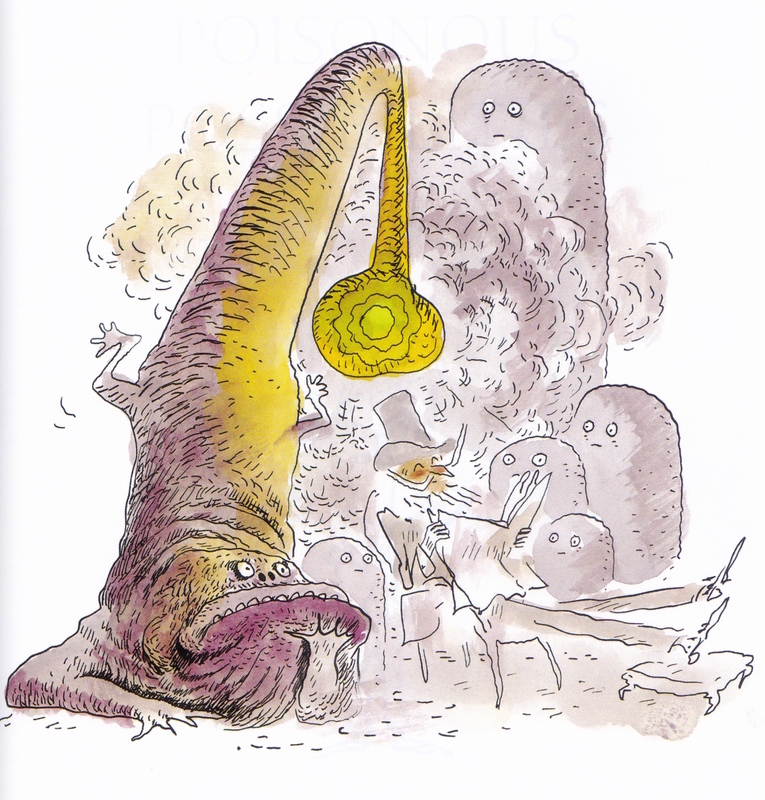 Perhaps the biggest offender of the verse interlude is Roald Dahl. Most famous are the songs of Willy Wonka’s singing slaves, the Oompa Loompas and their choruses celebrating the grisly fate of his objectionable visitors. It’s a memorable conceit and there are some very funny lines, but by god they don’t half go on – two, three pages sometimes. And in the sequel (the unlovable Great Glass Elevator) they are joined by Wonka himself, serenading a bunch of Vermicious Knids. Later in his career Dahl sensibly reined in the poetry from his novels, finding a far more satisfactory outlet for it in books like Dirty Beasts and Revolting Rhymes. 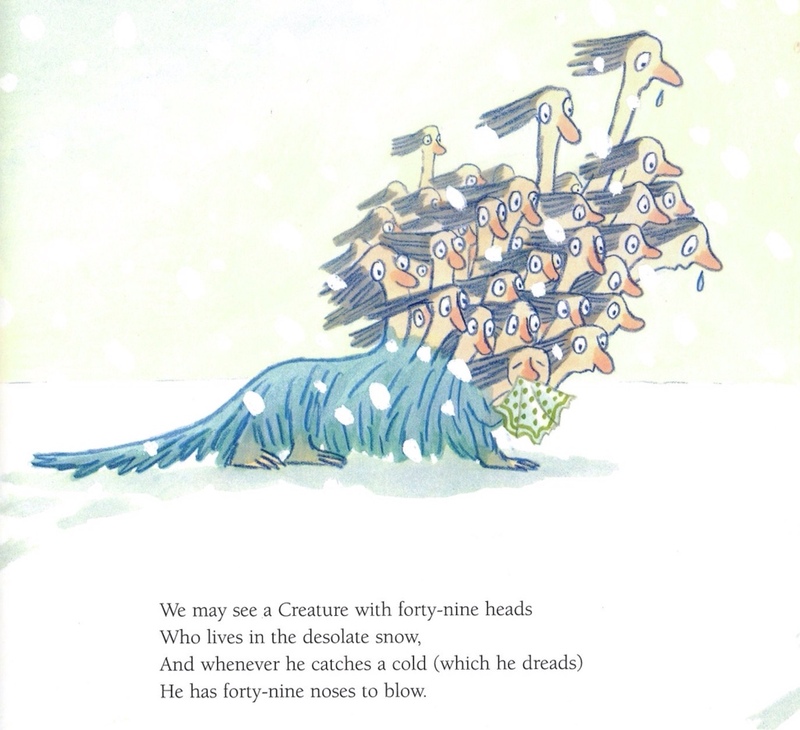 Here they were allowed to breathe, and came sumptuously illustrated by Rosemary Fawcett and Quentin Blake. 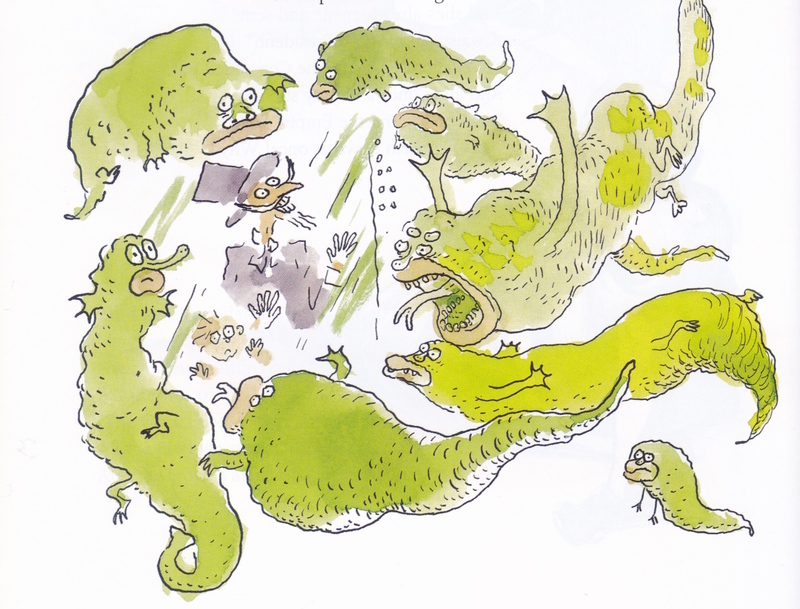 ‘If you are illustrating the book you can draw the centipede waving his many boots and singing; but you can’t really ask for two or three extra pages to show all the bizarre things that are mentioned.’ Quentin Blake in his introduction to Songs and Verse. 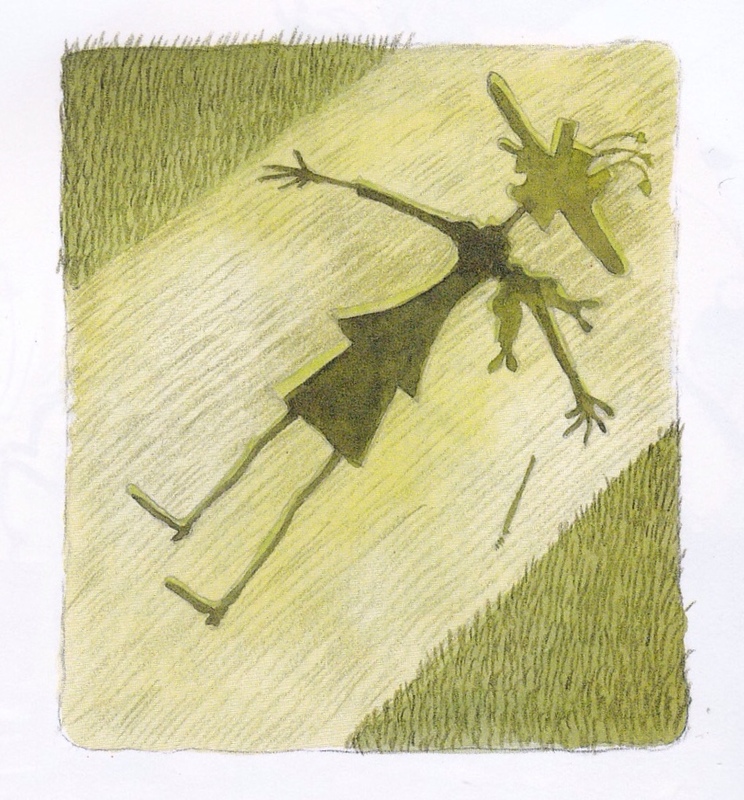 Songs and Verse presents poems from across all of his books, plus some unpublished work, all with brand new illustrations from some of the best in the business, including Chris Riddell, Posy Simmonds, Lauren Child and Emma Chichester Clark (above). Visually it’s very special, but the big revelation are the words. 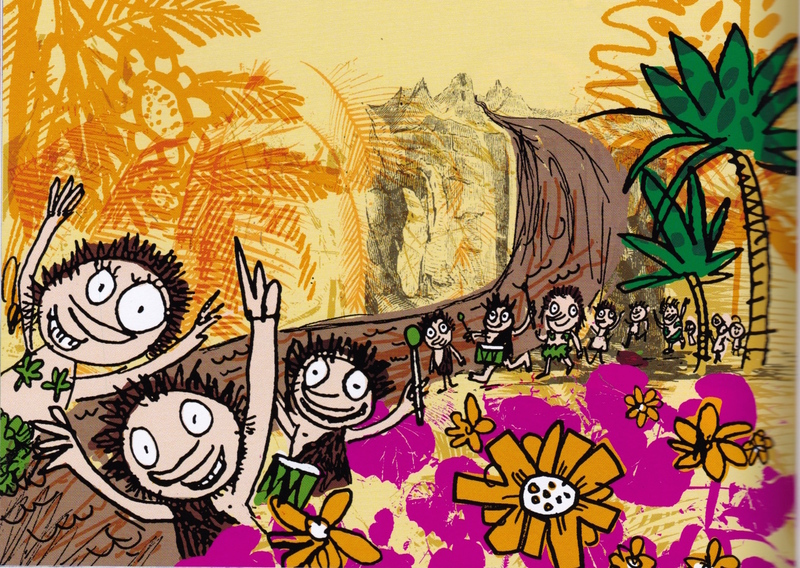 Taken out of narrative context and given their own platform they often work beautifully – showcasing Dahl at his inventive best, and sometimes his most remorselessly unforgiving. Aunt Sponge was terrifically fat, and tremendously flabby at that. Her tummy and waist were as soggy as paste – It was worse on the place where she sat! 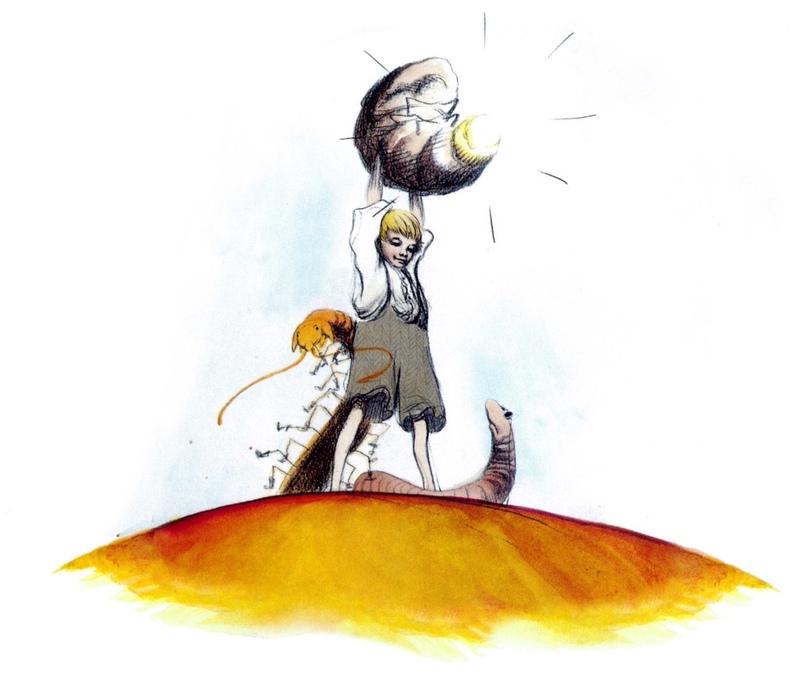 Best covered is Dahl’s first, and most verse heavy book James and the Giant Peach. 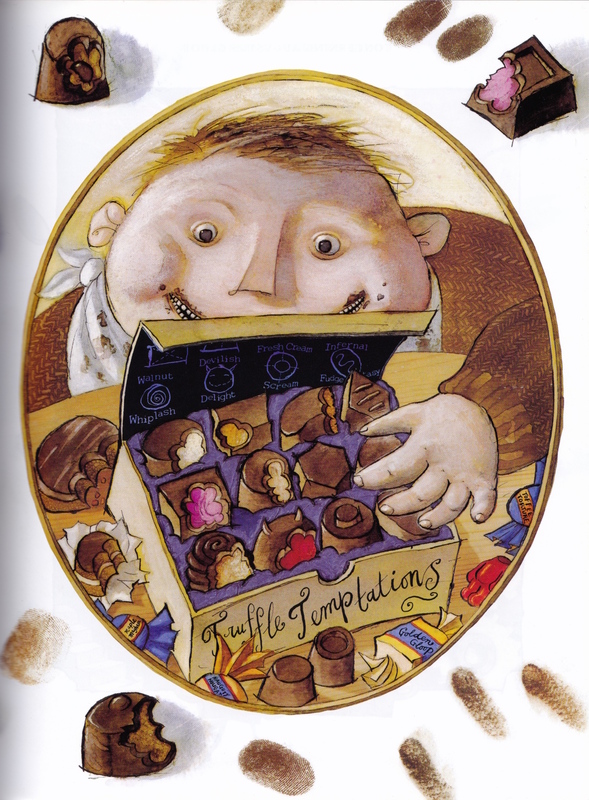 Here illustrated by Babette Cole, we are treated to the moment where Aunts Sponge and Spiker get their much deserved comeuppance, and Dahl indulges in on of his other bad habits, fat shaming. 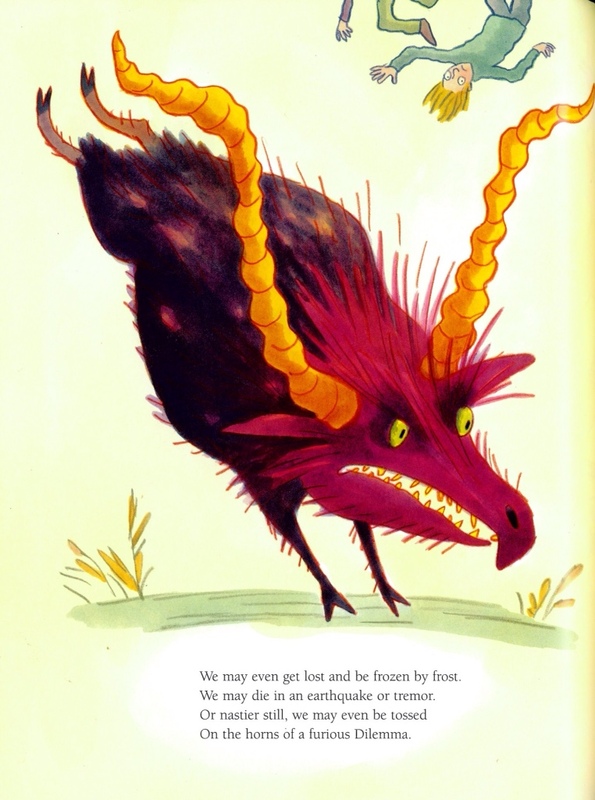 Emma Chichester Clark, who previously illustrated her own monochrome version of James and the Giant Peach is able to give full rein to her talents in this volume, bringing incredible colour to a poem outlining the fantastical things James and his friends might see once they roll their peach off the hill. The standout piece of Songs and Verse is a show-stopping number sung by James and illustrated by the brilliant Alexis Deacon as our hero emerges from the peach on top of the Empire State Building. One of the few moments which, I concede, is worthy of a song. 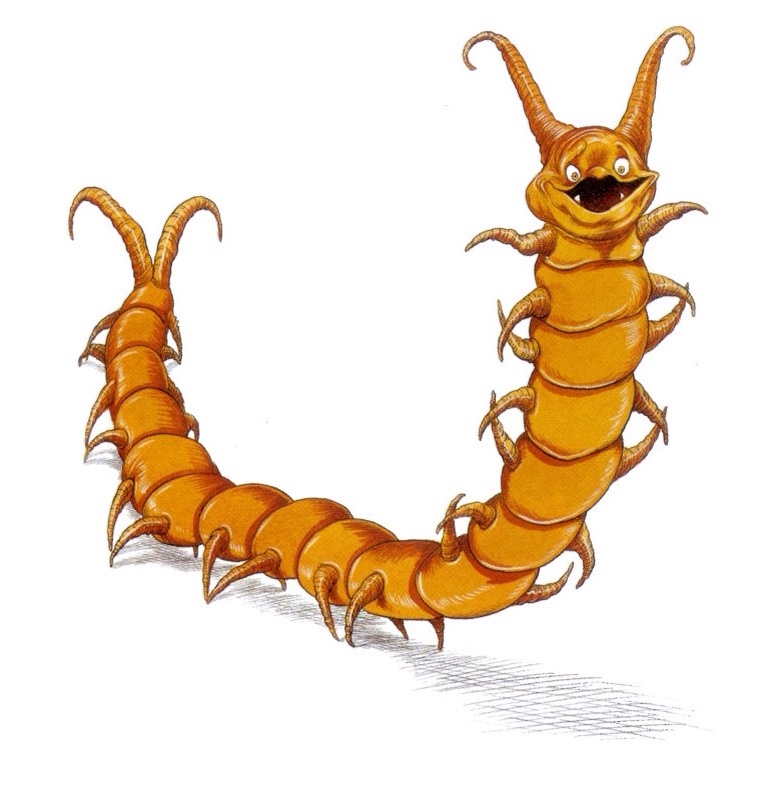 Surrounded by New York police he sets about extolling the virtues of his mutant insect immigrant friends – the nicest creatures in the wold. 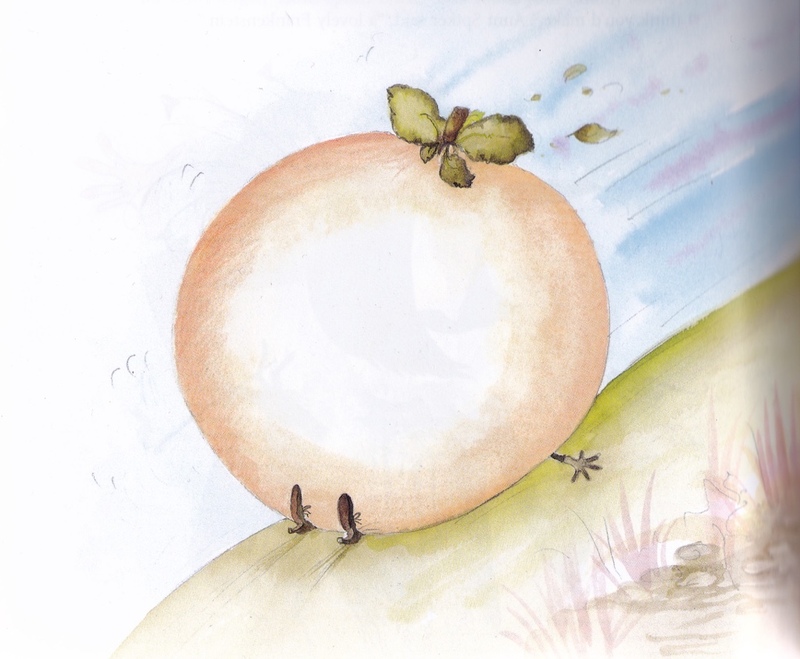 James and the Giant Peach was lauded by American critics on his release. 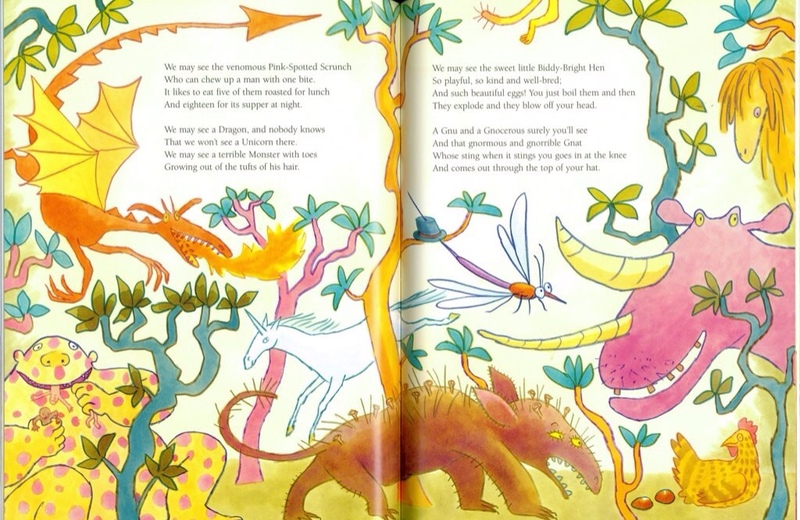 According to Jeremy Treglown they were ‘particularly enthusiastic about the jaunty poems, part Edward Lear, part Hilaire Belloc.’ Dahl’s commitment to children’s fiction as a ‘serious endeavour’ in the early days was shaky to say the least. 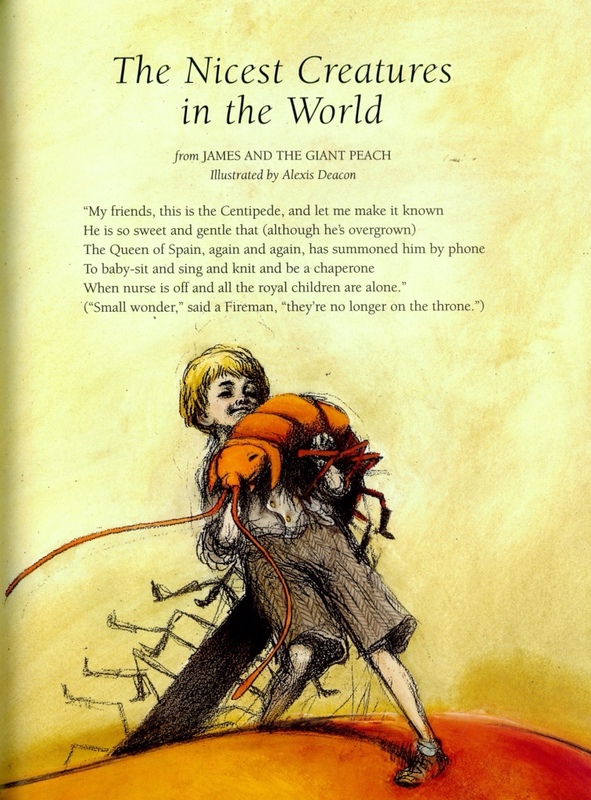 Treglown points out that throughout the creation of James and the Giant Peach, the author would wonder ‘what the hell am I writing this nonsense for?’ The comparison of his verse to respectable literary figures like Lear and Belloc would surely have encouraged the author to the poetical excesses of the Charlie books. Concerning Mike Teevee by Posy Simmonds. 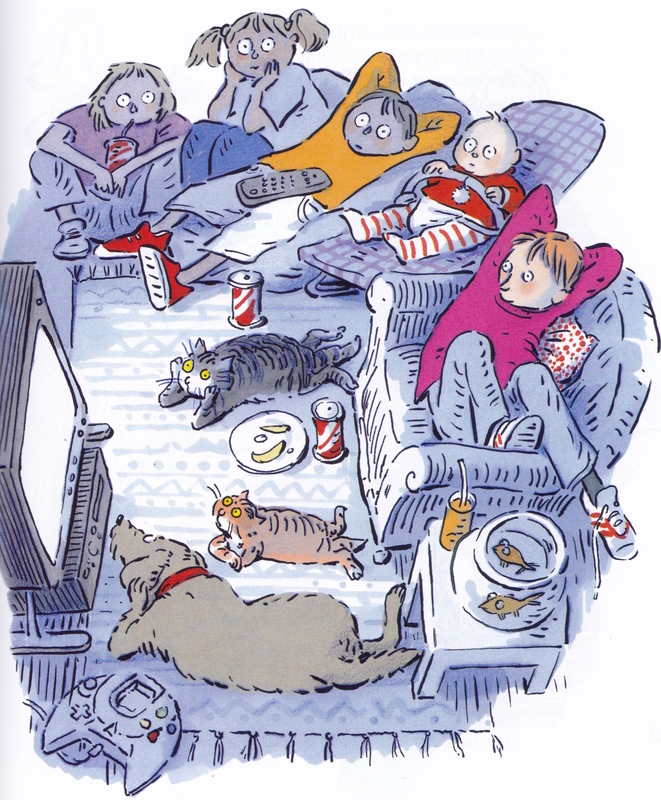 I’ll leave you with my favourite of all Dahl’s rhymes, rendered by the great Helen Oxenbury. Happy 100th Roald. Roald Dahl Songs and Verse is published by Penguin. Tags: Alexis Deacon, Babette Cole, Chris Riddell, Emma Chichester Clark, Helen Oxenbury, Joann Sfar, Mini Grey, Neal Layton, Posy Simmonds, Roald Dahl. Bookmark the permalink. 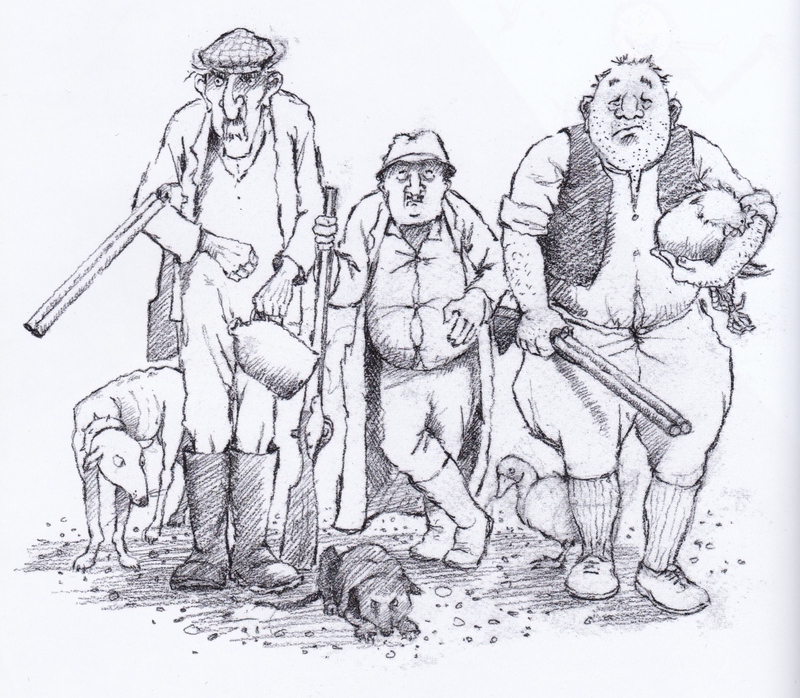 I must say that our kids, as I remember, laughed at Revolting Rhymes, as did we … A magnificent collection of illustrations, brilliant.